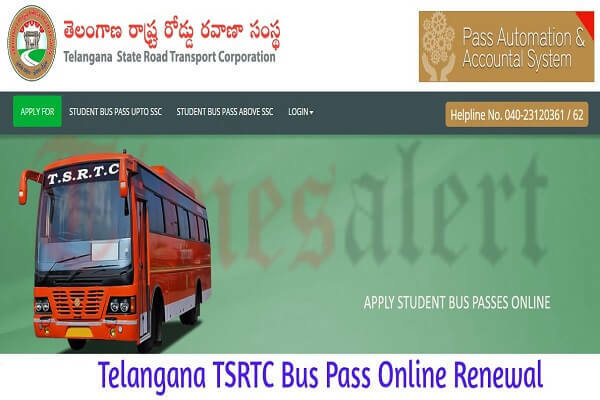 TSRTC Bus Pass Renewal Online; Telangana Government has published the Student bus pass renewal process through Online. The Candidates who want renewal their Telangana Bus passes can submit their applications through online on the official website of the TSRTC. As the Online application is very simple and easy. Students who are completed their 10th class are eligible to apply the TSRTC Studnet Bus pass online. TSRTC Bus pass online application form is available on the official website of Government of Telangana at www.tsrtcpass.in. Most of the students are very happy with the decision of Telangana Government that the bus pass can be applied through Online. As per the Government decision, it has also introduced the MCT, Vanitha pass, Cat card, and Navya Card services through Online. The Telangana State RTC has announced that applications for different types of students bus passes can be submitted from June 14th along with the candidates who are applying newly. As the Telangana State comprises 19 bus pass centers where the students can submit the filled application forms. Around 5 lakh people in the Greater Hyderabad are benefited with the newly introduced bus passes process. As the Telangana RTC stated that, in Hyderabad, around 50 centers are there for the bus pass renewal process but the crowd for bus pass has not decreased. To avoid this crowd issue Telangana RTC has introduced this Online renewal process. As usual, the RTC is providing the Free bus passes for the students below 12 years for boys and girls below 18 years (10th class). As the last date of this application, submission is on or before September 30th. Student Studying in Evening College shall enclose Unemployment Certificate issued by concerned Head of the Institution. Free bus passes are eligible for below 12 years for boys up to 7th class and girls below 18 years up to 10th class free bus passes will be issued only up to 30th September. Concessional bus passes for the students will be allowed up to the age of 35yrs. The entire image consisting of the photo along with the signature is required to be scanned and stored in *.jpg format on the local machine. Ensure that the size of the scanned image is not more than 50kb. If the size of the file is more than 50kb, then adjust the settings of the scanner such as the dpi resolution, no. of colors etc., during the process of scanning. Candidates need to visit the official website of RTC Hyderabad which is www.tsrtcpass.in. Select the TSRTC Online Bus to pass renewal link. Enter some mandatory details in the provided fields on the page. On typing, the details, Click on the Submit button. Your Online bus pass renewal request will be sent to the Greater Hyderabad RTC and will be processed in a few hours.